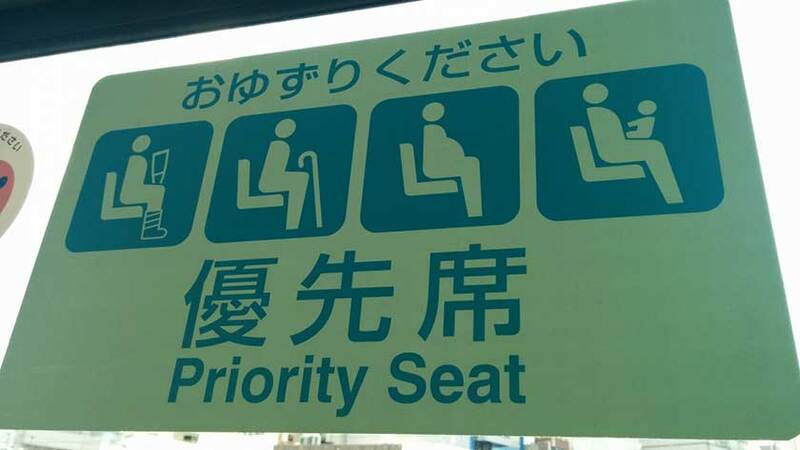 I have mentioned ‘Priority Seats’ before in my blog posts for Notes from Obstacle Course, they are the seats found on trains, buses and ferries in Japan, set aside for children, the pregnant, the elderly and those with disabilities. They are usually found at the ends of carriages. The general rule is that those who do not fall under the category of being a child, being with child, elderly or disabled should not sit on them. Last week RocketNews24 posted a challenging article entitled ‘Should healthy young men sit in Japanese trains’ priority seats for the elderly and pregnant?’ The article details the experience of one of their reporters, P.K. Sanjun, who noticed, after a number of friends and relatives became pregnant, that people rarely gave up their seats for those who were clearly pregnant. If I had 100 Yen for amount of times I have got a train and been faced by a row of salarymen and sometimes they are on their phones or drinking alcohol, whilst I, a physically disabled person and often a pregnant woman remained standing, I’d never have to actually work for money here in Japan. I too have experienced pregnant ladies offering their seat to me; I have also experienced elderly ladies ‘handbagging’ (assault with handbag), push the beer swilling salarymen off their seats, none of which the pregnant lady or the elderly lady should have to do. So at first glance, as person with a disability, it is difficult to condemn P.K.’s vigilantism as ‘Reserved Seat Man’, his motivation in ‘reserving’ priority seats for those who need them, is good, his heart is certainly in the right place. There’s also a bit of a gray area regarding what exactly constitutes membership in one of the priority seat target groups. Are you a senior at 53? Does having a half-healed sprained ankle qualify as physically impaired? Is your four-year-old kid such a “young child” that you need a special seat? It’s conceivable that people in such borderline situations might assume anyone already sitting in the priority seat needs it even more than they do, and thus not approach the priority seats so as not to make their occupants feel self-conscious or pressured to give them up. The second issue is this: Of course people should be kind and want to give up their seats to those that need them. However, encouraging people to ‘reserve’ them by sitting on them, I feel would ultimately be counterproductive, for two reasons. The first is that if someone is sitting on such a seat, I (who is also a generally kind person) will assume that you need it, that if you’re sitting on those seats you deserve to be there, and that just because I cannot see your disability, or recognize that you are pregnant (not necessarily apparent in the first few weeks), it does not follow that you do not qualify to take residence in the priority seats. I may know a great deal about being disabled but I don’t have House M.D. like diagnostic skills or X-Ray vision, I shall assume you need the seat and not ask you to move. The second issue I have is that encouraging good people to ‘reserve’ seats only confirms a negative view of the situation disabled people face: that (non disabled) people cannot be trusted to be kind, to give up seats, and that disabled people need help to ensure that they can get those seats. Now of course, I am of the opinion that people should give up their seats, and I encourage non disabled people to tell other non disabled people not to sit on the priority seats, unless they are in fact injured, elderly or pregnant. However, simply resigning ourselves to the fact that the ‘non-needy’ cannot be trusted to give up their seats, therefore, someone like P.K. will have to ‘reserve’ them for people like me, well, even I’m not that cynical about human nature. For more information on priority seats, read our article here.